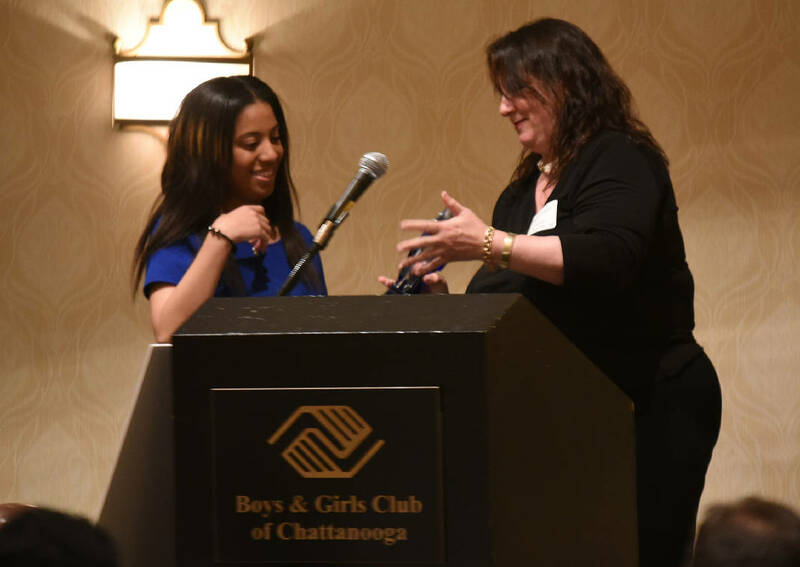 Vinceia Crittenden, 17, receives the first David Fussell Outstanding Leadership Award on Monday at the Boys and Girls Club of Chattanooga fundraising and awards dinner. Presenting the award is Elisabeth Donnovin, vice chairwoman of finance for the organization. Vinceia Crittenden spoke with ease and confidence on Monday night as she told a room full of people munching on burgers about the bumpy acne that formerly covered her face. With a beaming, radiant smile, Crittenden said it wasn't until she started mentoring younger girls at the Boys & Girls Club of Chattanooga that she realized the insignificance of her acne. "I have learned to walk with my head held high," she said. " ... It took mentoring these kids to realize that what is inside is important." Crittenden, 17, is a junior at Chattanooga Girls Leadership Academy, and was the recipient of the Boys & Girls Club of Chattanooga's annual Outstanding Leadership Award, now called the David Fussell Outstanding Leadership Award in honor of the club's former board member who died in October. In introducing Crittenden at the club's annual awards ceremony and fundraiser, board member Elisabeth Donnovin told the group of more than 200 how difficult it was to choose the recipient of this year's award. "We had an exceptional group [of candidates] and it was a hard decision, but [Crittenden] has served us proudly," Donnovin said. " ... The kids are looking at her with respect, and she leads them in a gentle, kind way. I think it shows a lot that all these kids respect her." Crittenden, who has been a part of the club for four years, said she appreciates everyone who has invested in her -- and the opportunity to now invest in other girls. "I help anywhere I can, from homework to snacks," she said from the podium. As the recipient of this year's award, Crittenden was given a $7,500 scholarship. She hopes to attend MTSU to study early childhood education and one day own her own day care facility. Following the award presentation, Damon Williams, senior vice president and chief educational and youth development officer for Boys & Girls Clubs of America, spoke. He shared his personal story about how the club influenced him and many of his peers when they were children, ending his speech by specifically talking to the students in the room. He told them he had three pieces of advice for them if they want to be successful. First, "embrace the grind" and work hard with passion in everything you do. Work to be better each day than the one before, he said next. And he urged the kids to be servants, saying, "Always give to those coming behind you." Contact staff writer Kendi Anderson at kendi.anderson@timesfreepress.com or 423-757-6592.